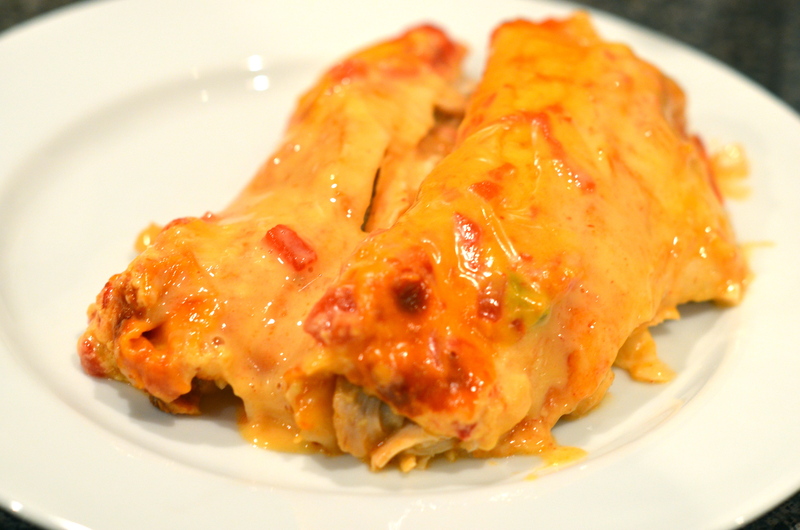 I may be overstepping my familial boundaries with this post, but I’m taking the liberty of sharing my in-laws chicken enchiladas with you all. 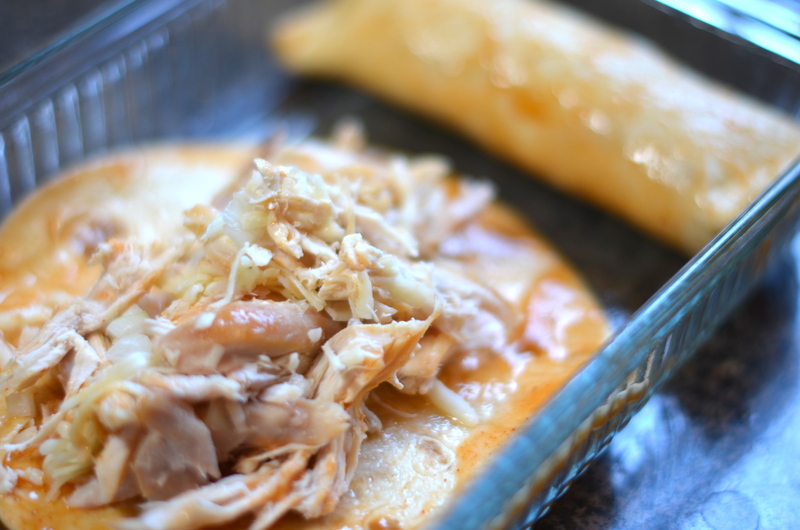 They’re not just any enchiladas either; these are Christmas Eve in Texas enchiladas, and I don’t know about you but I think that any traditional meal around the holidays is pretty sacred. My goal here is not to blaspheme anyone or anything which, for me, is harder than it sounds. My disclaimer here is that these may not be word-for-word the same recipe that is used on December 24, but it’s the adapted version that we’ve created at home when we need a little Christmas in May. Cravings are strong things and as a good wife, I’ve tried to figure out some of the home-cooking that creeps into the husband’s subconscious here and there and recreate it at home. This is not a tough recipe and good news is you can have these ready to go hours or a day in advance (save the cheesy topping) and have them at the ready in the fridge until it’s time to heat and eat. My favorite thing about this recipe has to be the nostalgia on my end that comes with the addition of Rotel and Velveeta. Velveeta gets a bum rap, and it probably should, but I don’t believe that there are many of us out there who can say that they don’t love Velveeta. And if you do, I firmly believe that you are lying or trying to be ironic. I still sing the song from the commercial years ago: “See Velveeta, is so creamy, it improves your Tetrazzini! When your cookbook, calls for cheddar, make it with Velveeta, it cooks better!” Music to my soul. It was a special day when a piping hot bowl of cheese dip would appear at the table with old school round tortilla chips on the side. 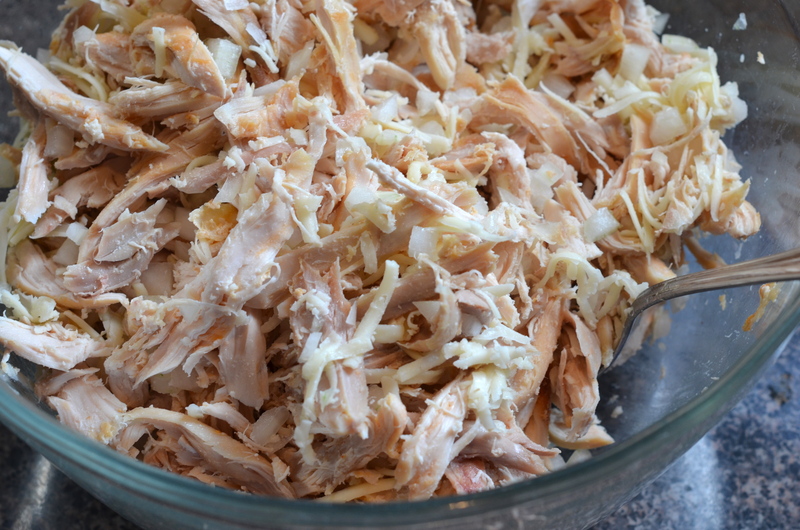 Get to pickin’, folks, and put the chicken, grated monterey jack cheese and onion in a large bowl. 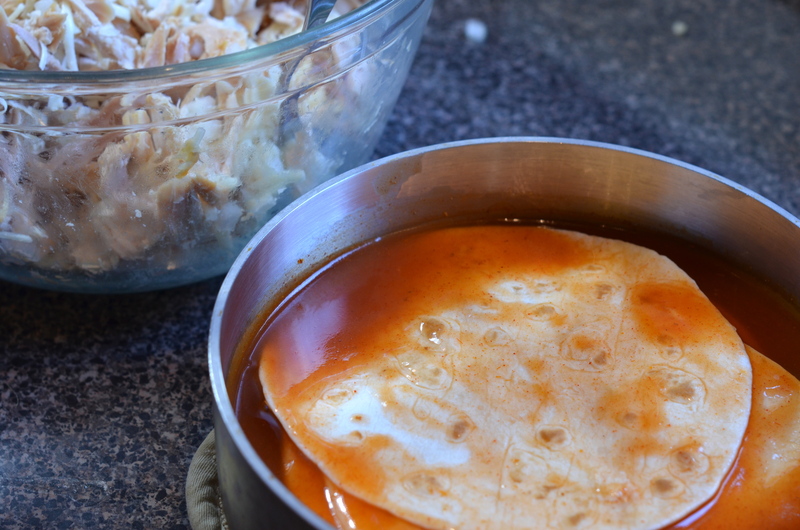 Pour the two cans of enchilada sauce into a medium-sized saucepan and heat over medium low on the stove. You’re going to dunk the tortillas in the warm enchilada sauce so they’ll soften up and absorb some of the tastiness prior to rolling. Grab a couple Pyrex dishes and let’s get this show on the road. 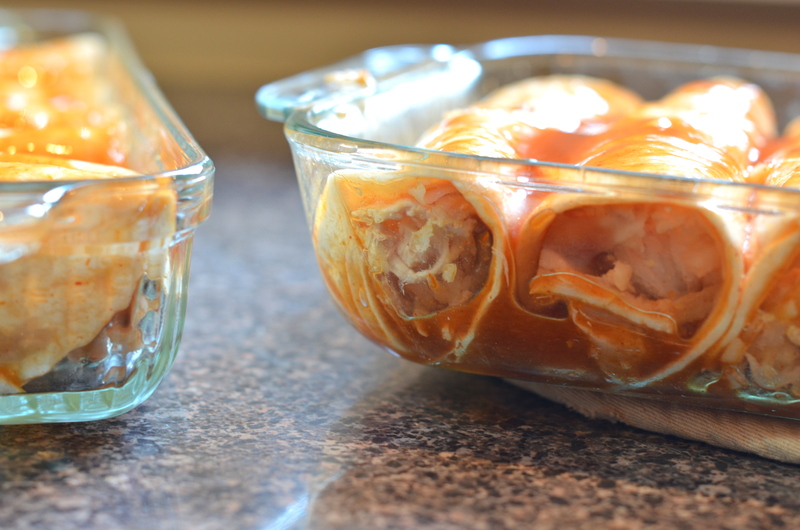 When you’ve crammed in all the enchiladas you can into your baking dishes, top with the remaining enchilada sauce and do one of two things: either cover and stick in the fridge until you’re ready to bake, or go ahead and get the Rotel cracking. Here’s where I shame the in-laws. I decided to refrigerate these while I went to the East Atlanta Beer Festival. When I got home, the Rotel came out and the baking occurred. The picture quality and my desire to prepare a nicely composed final picture were left at the festival, so forgive the shall we say, minimalist approach to these final photos. Preheat your oven to 350°F. 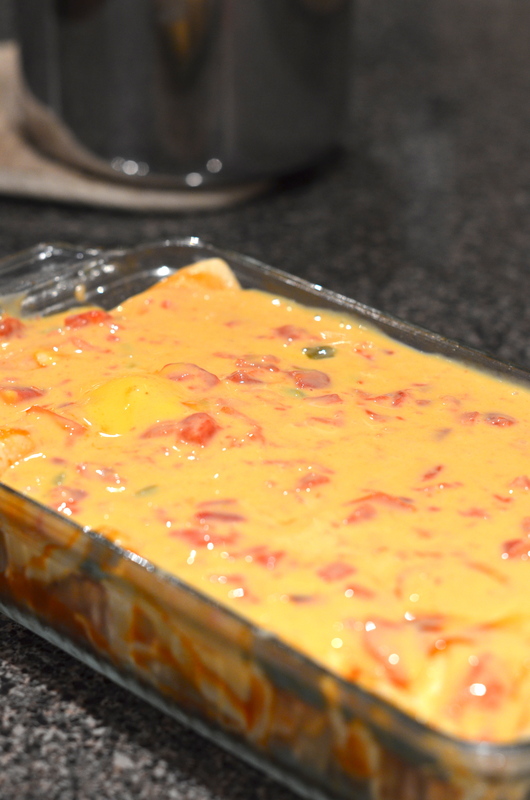 Heat your Velveeta and Rotel on the stove or microwave, depending on how you were raised, and pour 1/3 to 1/2 the mixture (however much will fit) over the enchiladas before baking for about 30 minutes until heated through. Feel free to eat the rest of the Rotel in your pajamas on your couch. Bake and serve. 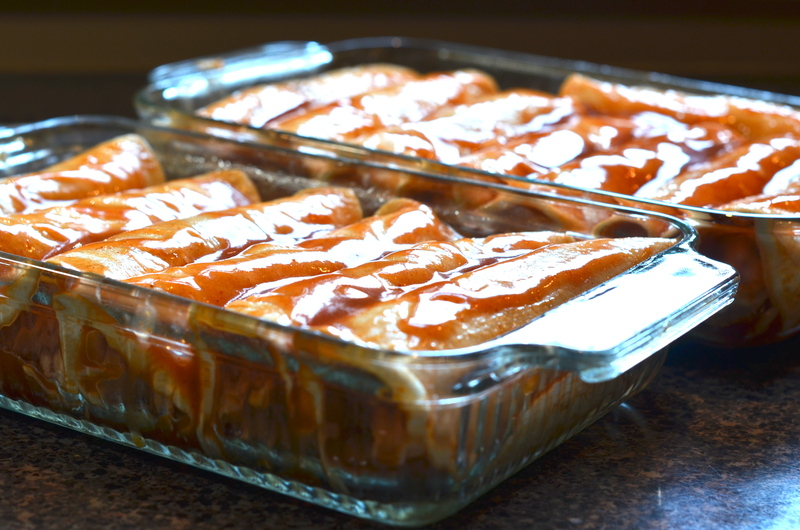 These go well with rice and refried black beans but even though I made those before the beer festival, I only had eyes for enchiladas. Here is a tip … check your frozen food section for Bueno Green Chilies from New Mexicon in a green plastic container. Defrost for 1 minute in the microwave and chip away about 2-4 TBSP, depending on how much you like the heat. 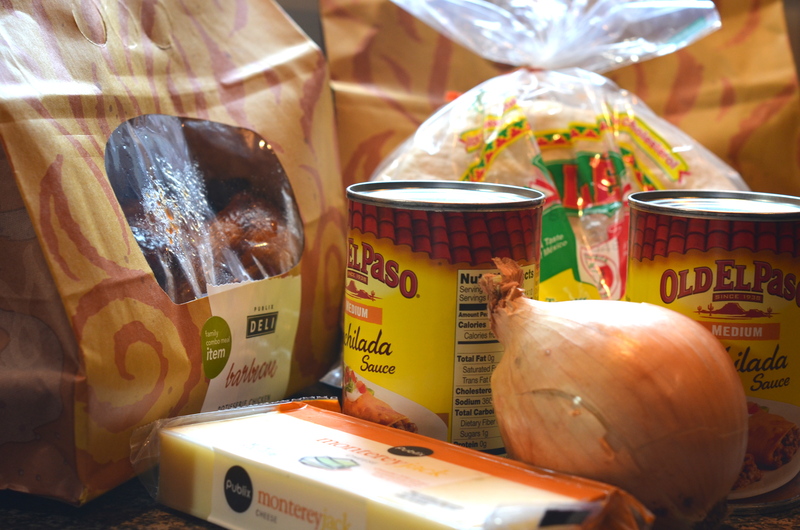 Add to any mexican favorite. I like mixing either chicken or beef with a block of cream cheese, adding green chilies, then filling flour or corn tortillas. Yum! I love spicy things! Great suggestion – I’ll have to look for them. Made these tonight for some friends and they were a big hit!! Several with homemade salsa and lots of margarita’s. Once again fabulous recipe!! I’m so glad they turned out!